Syrian security forces have raided a den of armed terrorists in a house in western Damascus, state media reports. The fighting lasted for two hours with grenade blasts and machine gun fire being heard from the district of al-Mezzeh, witnesses say. 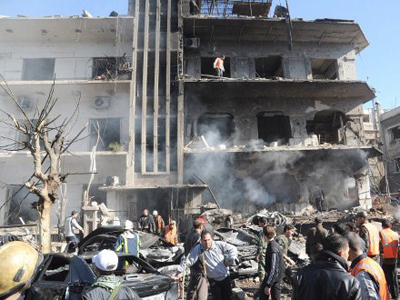 Local civilians had been evacuated to safety before the raid, state news agency SANA reported. Two insurgents have been killed while another one captured as government security forces stormed the building. According to the independent Al Ekhbariya tv channel, three terrorists were killed in the operation. The clash resulted in at least one death of a law enforcement officer, while three more were injured in a shoot-out, reports say. According to earlier eyewitness reports, fighting broke out between opposition groups and state security forces in the Syrian capital on Monday morning. The embattled neighborhood is heavily guarded and holds several government security installations. It has previously paid host to large anti-Assad protests. "There is fighting near Hamada supermarket and the sound of explosions there and elsewhere in the neighborhood. Security police have blocked several side streets and the street lighting has been cut off," a housewife who lives in the area said to Reuters earlier. Damascus has been largely free of daily fire fights since the uprising against Assad began a year ago. 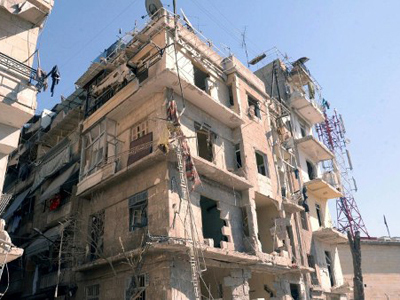 Rebels, who are active in the suburbs, rarely attack in the capital where Assad’s troops are deployed. Free Syrian Army leader, Colonel Riad al-Asaad, refused to comment on the fighting in Damascus when contacted by AP. “This is a sensitive military matter that we cannot comment about,” he said from Turkey. “It's a positive for the opposition that they are able to fight to Damascus; the downside is that when civilians get killed then the opposition is as much to blame as the Assad regime,” he said. The fighting comes off the back of several bomb blasts in the Syrian capital and the country’s second city Aleppo over the weekend. 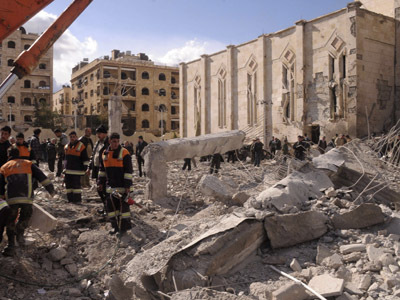 A car bomb exploded in a residential district of Aleppo on Sunday, killing two people and wounding a further 30. 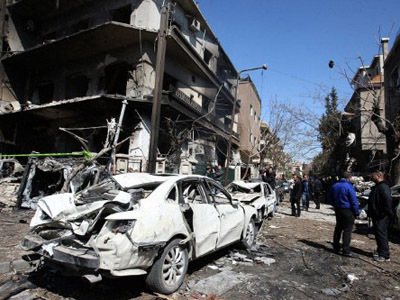 Meanwhile, in Damascus 27 people were left dead on Saturday after twin explosions targeted security installations in the city. The Syrian government has branded the explosions as “terrorist attacks”, whereas opposition rebels point the finger at Assad’s regime, accusing them of trying to discredit rebel groups. Funerals were held in Damascus on Sunday to mourn the deaths of those who perished in the explosions. Police reportedly intervened in the event, beating and arresting people when activists started shouting "the people want to topple the regime". The Red Cross says the humanitarian situation in Syria is deteriorating and needs an urgent solution. “Our assessment, unfortunately, is that the humanitarian situation is most likely to deteriorate,” Jakob Kellenberger, the head of the International Committee of the Red Cross, told Russia’s Foreign Minister Sergey Lavrov during their meeting on Monday. Russia and the Red Cross are calling on the Syrian government and the opposition to agree on daily humanitarian ceasefires. The ICRC wants the Syrian Government to allow more humanitarian aid access for people in the conflict zones. Kellenberger called for daily two-hour ceasefires, which he says are necessary for medical evacuations and delivery of aid those in need. In response to the recent bombings, UN Secretary General Ban Ki-moon also called for a ceasefire and offered his condolences to the bereaved families. A UN technical mission entered Syria on Friday to assess the humanitarian situation and discuss the establishment of international monitors in the violence-torn country. The mission will cover 15 cities, and the subsequent report on the humanitarian needs of the Syrian people will be submitted to the United Nations. The international community’s efforts to curtail the spiraling violence in Syria have yet to yield palpable results, with both the regime and opposition leaders refusing to open a dialogue. 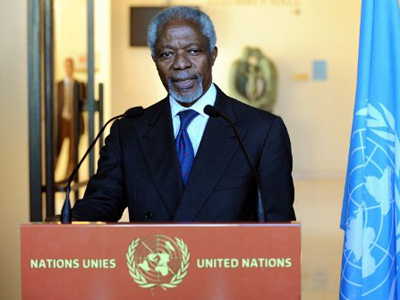 The year-long conflict in Syria has claimed more than 8,000 lives according to UN estimations. Assad’s regime blames terrorists and armed groups for the unrest and says that 2,000 security forces have been killed since the conflict began.